ChemKnits is now on Patreon! I have some exciting news! 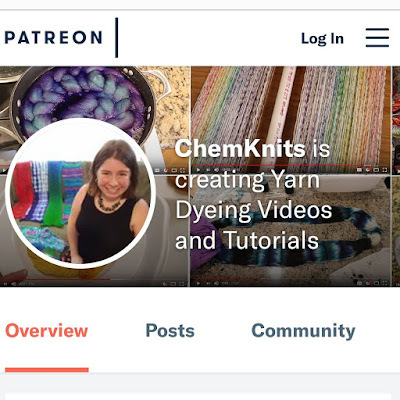 ChemKnits is now on Patreon! What does this mean? Patreon is website that allows people to support their favorite artists and creators. This is a way for you to pay creators on a monthly basis to help support the content that you love. It is like an optional subscription service. Early Access to new dyeing videos. I will share these videos in the monthly Patreon newsletter. These videos will eventually be available to the public on the ChemKnits Tutorials YouTube channel. Exclusive Behind the Scenes Sneak Peeks - Want to watch as I film a scene for a new dyeing video? Patrons can choose rewards that give them access to fun and interactive sneak peeks. Advance notice of when hand dyed destash sales will start so you can get a head start to check out the pretty colors. What does the Patreon mean for the ChemKnits Tutorials YouTube Channel? Are you still going to make new videos? I will 100% keep making new videos for the ChemKnits Tutorials YouTube channel. The purpose of the Patreon is to help fund the yarn, dye, and equipment so I can continue to make fun dyeing videos that everyone can enjoy. The main difference is that you might hear me mention the Patreon from time to time in my videos. The public content will not decrease at all, if anything I will be adding more fun videos to the channel. If I can't become a Patron, how can I support you? Subscribe to the ChemKnits Tutorials YouTube Channel (which is free! ), watch videos, and give a thumbs up to the ones you enjoy. Engaging with my videos is the best way that you can support me!